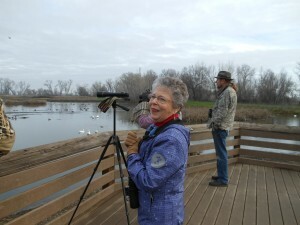 The Christmas Bird Count (CBC) on Dec. 16 was Redbud Audubon’s 43rd year of participating in this fun and interesting day. A full report by Kathy Barnwell on the count is available and can also be found in the The Western Grebe March newsletter. However, some general information is that approximately 129 species were seen and 60,000 birds counted all together; there were 37 participants. The highlight birds this year were the Black-headed Grosbeak seen by Greg Guisti at his bird feeder in Kelseyville; the Short-eared Owl, seen by Jerry White, and a Surf Scoter seen by Gae Henry and Henry Bornstein in Anderson Marsh. This year, the annual Clear Lake Christmas Bird Count, held by the Redbud Audubon Society, will be on Saturday, December 16. The Christmas Bird Count (CBC) is a traditional project of Audubon societies around the country and takes place between Dec. 14 and Jan. 5. If you are interested in participating in the bird count, call (707) 263-8030, leave a message with your phone number, and someone will return your call. Prior to the bird count the annual Bird Identification program will be held at the regular Redbud Audubon Society, which will be held early this year on December 14, the second Thursday of the month instead of the third. Please see the December newsletter for further details. A summary report of the Christmas Bird Count 2016 was made available in March 2017 as well as the official 2016 Bird Count statistics. The Christmas Bird Count (CBC) is a traditional project of A udubon societies around the country and takes place each year between December 14 and January 5. On the day of the Count, birders gather to record every individual bird and species encountered. Each count group has a designated circle of 15 miles in diameter and tries to cover as much ground as possible. The data collected by each count group are then sent to the National Audubon Headquarters in New York and is available on-line. Redbud Audubon invites all birders and nature enthusiasts to join in the upcoming Christmas Bird Count. Birders of all skill levels are encouraged to participate. This is Audubon’s longest running wintertime tradition and CBC 2017 will mark the 41st year the Count has taken place in Lake County.